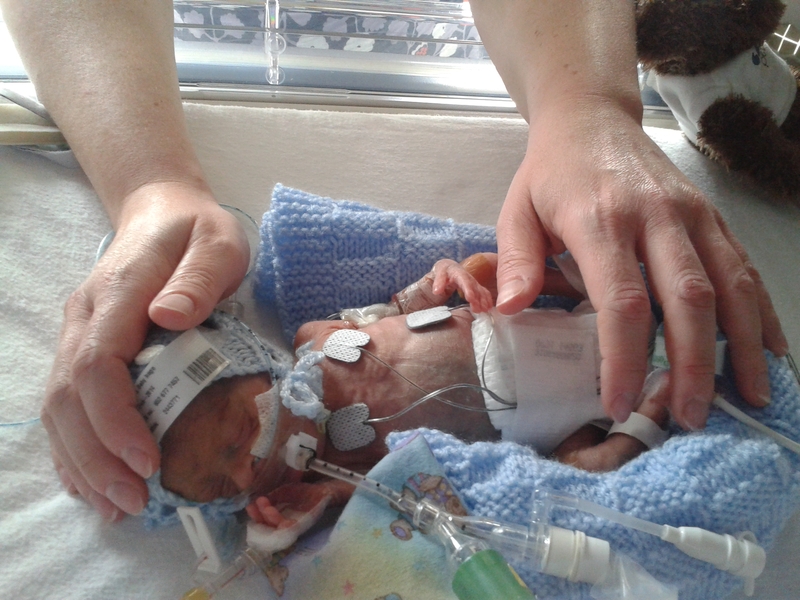 I had to give birth to my beautiful son Hugo 16 weeks early due to HELLP syndrome and severe pre-eclampsia. This rare pregnancy complication nearly claimed my life, and took the life of my precious baby, Hugo. I had never heard of HELLP before my diagnosis, and my family and friends had not heard of it either. While nothing more could have been done to help Hugo, who fought for life for 35 days, HELLP is so serious I would like to raise awareness of it in his memory. After all, it is impossible to know the symptoms of a condition you don’t even know exists. ‘LP’ is for low platelet count – platelets are cells in the blood that help it to clot. The syndrome is usually a complication of pre-eclampsia. Like pre-eclampsia, it can happen only in pregnancy. It is most likely to occur immediately after the baby is delivered, but can appear any time after 20 weeks of pregnancy, and in rare cases before 20 weeks. The only way to treat both conditions is to deliver the baby as soon as possible. The symptoms of HELLP syndrome are outlined below. I have elaborated on them with my own experiences in this separate post. Other signs of pre-eclampsia include high blood pressure and protein in the urine. This is why it is vital pregnant women attend their routine community midwife appointments, as these are always checked. Action on Pre-Eclampsia also has more information about the signs and symptoms of HELLP. Many of the symptoms in the list above are easy to confuse with common pregnancy discomforts. I would like to balance raising awareness with not frightening pregnant women, or giving them more to worry about as for most women, they will be genuine pregnancy aches. If you are at all worried about anything during pregnancy, or if something ‘just doesn’t feel right’, call your midwife, or GP. Your midwife or GP shouldn’t mind, and if they do – insist. All it takes are a few simple checks (that could include taking your blood pressure, dipping your urine sample and checking your baby’s heartbeat). This is most likely to help put your mind at rest, and you can go home and look forward to your baby’s arrival. If, in the rare event you do have something like pre-eclampsia or HELLP, the earlier it is diagnosed, the earlier it can be treated. This means you will get better quicker, and it could help your baby too. Fortunately, I had a routine 24 week community midwife appointment just a few days after the symptoms appeared. I had made a mental note to mention the discomforts I had recently developed, and especially to ask for a stronger heartburn medicine as regular over-the-counter supplies were doing nothing for me. blood pressure and protein in my urine, and combined with the other symptoms I’d complained of sent me straight to hospital. I had the best-possible treatment the NHS had to offer. 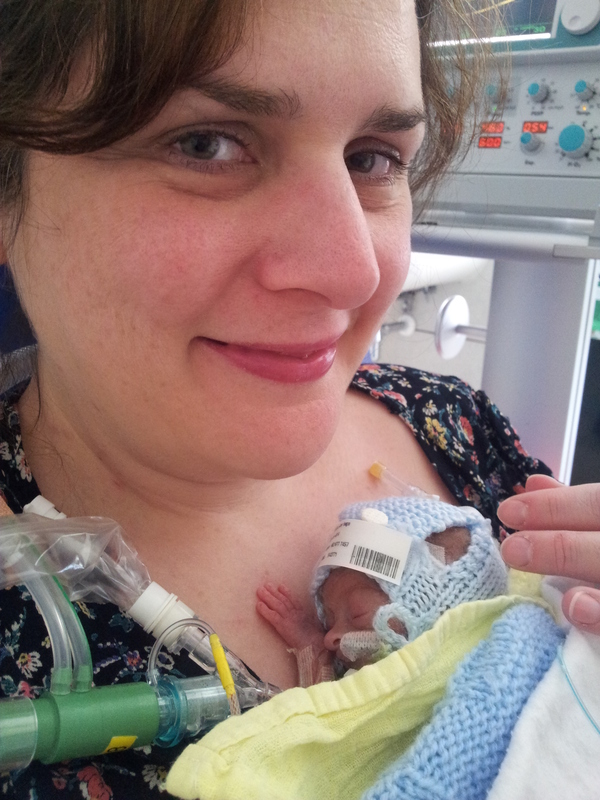 Hugo had to be delivered to prevent my organs failing – I would have died, and Hugo would have had no chance at life. I am dedicating my focus to HELLP syndrome because more people have heard of pre-eclampsia – but if you haven’t, you can read more about it on NHS Choices or The Pre-Eclampsia Foundation (the latter is from the US). Pre-eclampsia affects about 5% of pregnancies, and severe cases afflict about 2%. An smaller percentage will develop HELLP, and the number of women who will develop pre-eclampsia and HELLP at 24 weeks as I did, is even more minute. Maybe I was just unlucky to get HELLP, but I am also due to have tests to see if it was caused by an underlying issue such as an auto-immune condition or blood clotting disorder. HELLP is a devastating condition. The only cure can have tragic consequences for the baby, as it did for my Hugo. I hope raising awareness of it can help another woman and her baby, in Hugo’s memory. I should be 33 weeks’ pregnant today. I should be looking forward to meeting my son, rather than visiting his grave. I should be dreaming of our lives together, rather than experiencing flashbacks about his death, and nightmares about being guilty of killing my baby. This is one small way of helping me deal with the infinite sadness that I feel; the loss of my baby and of hope for the future, at the rage I feel towards my body for having a meltdown and failing to protect my much-wanted, much-loved baby who I miss so much. Hugo enjoying a comfort hold from me. Leigh, I am so sorry for your loss of Hugo. What a beautiful little man. 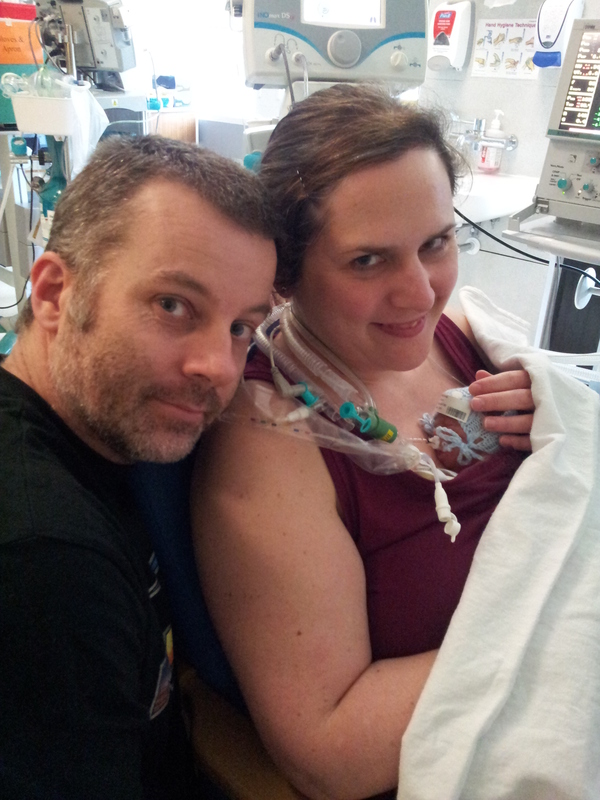 I too gave birth to a son prematurely (27 weeks) due to severe preeclampsia and HELLP. Ethan was in NICU/SCBU for 88 days and we came close to losing him on several occasions due to complications. I still can’t begin to imagine your pain. A month before my HELLP diagnosis I found I had a DVT in my right leg – hip to ankle. And have subsequently been diagnosed with a clotting disorder – APS. It seems I had been very lucky until my pregnancy. Please let me know if I can help in any way as you raise awareness. Thank you for sharing your story and bringing awareness to HELLP Syndrome. I am so very sorry for the loss of Hugo. I developed HELLP Syndrome at 32 weeks. My symptoms were headaches, swollen ankles and hands, low platelets, protein in my urine, high blood pressure and severe pain under my ribs on the right. Having never experienced indigestion, I put the pain down to indigestion and drank bottles and bottles of gaviscon, wondering why it didn’t help. It wasn’t indigestion at all, it was my liver failing. The twins stopped growing at 32 weeks and I got extremely poorly. I googled and found HELLP Syndrome but I was told “don’t be silly, that’s extremely rare”. I was in hospital every other day but they refused to treat me as they said my bp wasn’t high enough. At 36 weeks I demanded an induction. I was so poorly I could barely think, walk or do anything. The midwife told me off for wasting her time but my consultant agreed. The twins were born at 36+4 weighing less than they had at their 32 week scan, but perfectly healthy. That night I was taken into intensive care and the doctors questioned if I’d make it through the night. My kidneys and liver had stopped working. My dehydration levels were at minus 20. My HB was 6. I finally got my HELLP Syndrome diagnosis but if I hadn’t been so demanding, I’d be dead now. I am thankful every day that my twins survived and I am so sorry to hear of people like yourself who weren’t so lucky. Hello, I just want to say how sorry I am that you lost Hugo due to such an horrendous pregnancy complication. I developed severe Pre-eclampsia and HELLP Syndrome and my baby boy had to be delivered by emergency Csection at 32weeks. I too was in Intensive Care and didnt get to see my son until he was almost 24hours olmd. Thankfully both he and I are now doing really well, and I am so grateful of this everyday! My son is now a cheeky 17month old, showing no signs of his prematurity. Thank you so much for sharing your story and rasining awareness about such an unknown and devastating pregnancy complication. I would love to Hellp raise awareness! My son Easton & I went thru the exact same thing. I had HELLP and it was the worst thing ever, I had no idea about it. Left me in the hospital for a long time and my son spent 107 days in the NICU. We live in Ottawa, Canada and I would love to help in anyway I can! Hi Leigh! I am a midwife with a special interest in neonatology. Your precious Hugo is gorgeous and I am so sorry for your loss. You have done a great job in writing about HELLP Syndrome and I hope you find some comfort in the education that you are providing to others. Bless you for turning your grief into such a public service. I’m so sorry you are going through this, I don’t even want to imagine that pain so I hope time passes quickly for you so that the pain will ease a bit. The decisions you’ve had to make are heartbreaking but they aren’t your fault. I hope you have a much happier future even though it seems so bleak right now. Thank you for sharing this and possibly saving another lady’s life. I also was diagnosed with hellp just recently and delivered my son at 34 weeks. I would just like to put it out there as awareness for women that I had NO high blood pressure or protein in the urine. I just had pain. They took blood work and found my liver was inflamed and my platelet levels were low and my liver enzyme levels were high. It is very rare but can happen which is very critical in that if u do not feel right please get checked out. I wasn’t going to go in to emergency because I honestly thought I was suffering from indigestion and did not want to be embarrassed by being told that. But it wasn’t. And the severity of hellp comes quickly. I went in on a Friday and the hellp had become so severe my son had to be born on the Monday. Luckily my son is healthy and I am better but if I hadn’t gone in it could have gone differently. I had never heard of HELPP until I read your post. Losing a child must be heart breaking and to have to watch Hugo struggle for life must have been so hard. You are doing the right thing by raising awareness and if it helps to alleviate the sadness you must be feeling, even if for only a moment, then even better. I wish you well for the future and hope you go on to have a straightforward pregnancy in the future. Thank you for sharing your story, it may save someones life. I am a HELLP surviver. I lost my precious son and I almost lost my life at week 27. Thank you for writing this! Firstly I just wanted to say well done for writing this in the hope of helping others whilst you’re dealing with such grief! Im so so sorry for your loss! At 27wks I know how scary every little ‘change’ in your body is. Reading this has made me more conscious to think seriously about any symptoms in which I don’t feel right about. Thank you for raising awareness! Take care!